Okt.20-2018 The new owners of the cruise ship Oriana are a joint venture company between CTS (China Travel Service) and Cosco (China Ocean Shipping Group Company), who recently purchased the 1995-built vessel from P&O Cruises.Oriana is currently sailing on a bareboat charter back to P&O in Europe, and will be handed over to the new joint venture mid-August 2019. The vessel will start operating ex-China cruises around middle September 2019. P&O 's first newbuilding for almost 30 year's. Slighty larger sistership Aurora. Oriana is the first cruise ship commissioned for P&O Cruises. Built by Meyer Werft, the vessel entered service in April 1995 as the first cruise ship designed for the British cruise market. Entered service: 1995 – Refits: 2006/2011/2014 - Gross tonnage: 69.840 - Pass. lower beds: 1872 - All berths: 2029 - Passenger decks: 10 -Length: 260 m. - Beam: 32,20 m. - Drive diesel: 2x 6 cyl.diesel engines make MAN-B&W type 6L58/64 - 2x 9 cyl.diesel engines make MAN-B&W type 9L58/64 - Total installed power: 47.750 kW. - Propulsion: by 2 controllable pitch propellers through two Renk-Tacke gearboxes. The gear boxes are coupled to engines via Vulkan-Rato couplings. - Power each 19.875 kW. - Max. speed 26 knots - Service speed: 24 knots - Built: Meyer Werft - Germany - Yard no. 636 - Flag: Bermuda - Classification: LR. 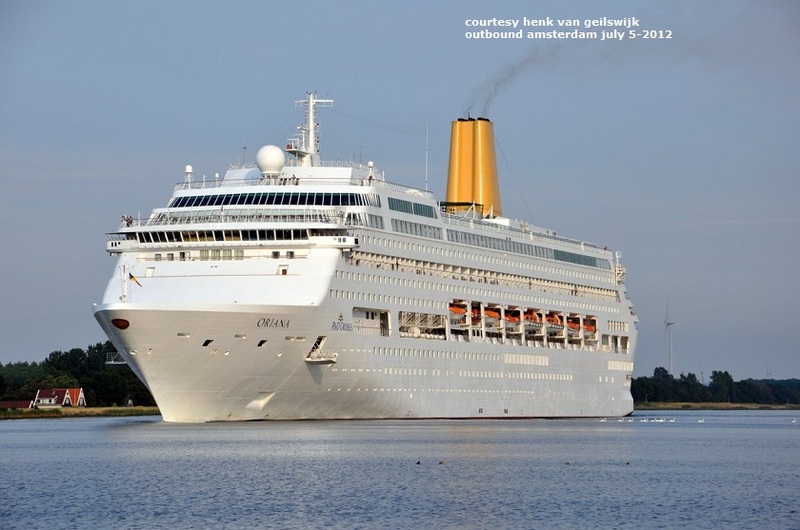 From nov. 30-2011 Oriana will be an adult only ship. Transformation which will see the addition of 27 new cabins, including balconies and singles, in place of the current children’s areas. Sorrento, a stylish new, light and airy Italian restaurant with ocean views and an outdoor dining area will be added, the Oasis Spa will be updated, and the deck 8 aft children’s pool will be replaced with a relaxing seating area complemented by the existing deck bar. Nov. 19 -2011 Blohm + Voss Repair in Hamburg has docked P&O Cruises’ 69,153gt Oriana in its Floating Dock 11 for a month of technical maintenance and interior renovation up to December 17th. The work is extensive and covers widely different sectors". It includes the installation of a duck-tail for added stabilisation and passenger comfort. That means that more cabins can be added and some public areas are also being converted into new interior and exterior cabins. Maintenance work included the removal and overhaul of the ship’s stern drive shaft as well as the overhaul and renewal of engines, machinery and piping, electric and control systems. No further details of that were immediately available. Dec.19-2011 P&O Cruises welcomed Oriana back into Southampton today after a month-long dry dock refurbishment which transformed the ship so it is exclusively for adults. The re-fit saw the addition of 27 new cabins and the introduction of an Ocean Grill restaurant by Marco Pierre White, now proving very popular on P&O Cruises Adonia. Aug.-2016. P&O have announced that they will be completing a major refurbishment of the Oriana is set to have a refit set to change everything from the cabins, suites and entertainment areas to the restaurants, bars and public areas. The ship was first launched in 1995 and last had a face lift in 2011. The new revamp was announced by P&O in response to feedback that they had from guests. The adult only ship will also have changes made to the Peninsular and Oriental restaurants where there will be a new colour scheme, carpets, curtains and lighting. images below after 2011 refit.